I just got a report from Kristin, who is still in the study area. The chick hatched and reared on little Buck Lake popped over to Crescent Lake for a visit. Kristin was excited, because she had seen many cases of juveniles flapping their wings and practicing takeoffs, but this was the first flight of a juvenile she had recorded to a nearby lake. Thus begins the phase of juvenile wandering that characterizes the fall months. If this year proves typical, trips of maturing juveniles to neighboring lakes — sometimes up to 10-15 miles from their natal lake — will abound in the next 9 to 10 weeks. But why do juveniles abandon the comforts and familiarity of their home lake to venture to lakes unknown? This is a difficult question with many possible answers. First, let’s think about the downside of such movements. In deserting its natal lake, a juvenile will be faced with new food sources to which it will have to adjust. Since it must feed itself and mature rapidly to put on weight for fall migration, leaving home seems a gamble. A new lake will also contain new risks in the form of predators or aggressive territory holders (although aggression is generally low in the fall, to be sure). In order for wandering to new lakes to be a sound behavioral strategy, we would expect there to be advantages that more than offset these risks. One can imagine a number of potential benefits to shifting to a new lake. In the case of the Buck juvenile observed by Kristin, the bird was moving from a small lake with limited food resources to a much larger lake with a more abundant prey base. So the short-term benefit of being able to capture more food and put on weight for migration might be a large part of the explanation. Catching and consuming new food items might pay benefits down the road for young loons, as well, as this forces them to practice new modes of foraging that might be useful during migration and winter, when they will be faced with vastly different prey. There is a third and more nebulous hypothesis that might explain wandering by juveniles in fall. Three to four month-old individuals might be laying the groundwork for their lives as adults by exposing themselves to many different lakes and learning which are most suitable for them. That is, juveniles might try out lakes of different sizes and shapes containing different fish and invertebrates as a means of finding out what sort of lake allows them to feed most efficiently. If so, this period of exploration might allow them to target lakes more effectively when they return to northern Wisconsin (as they do) to look for a breeding territory in 2 to 5 years. 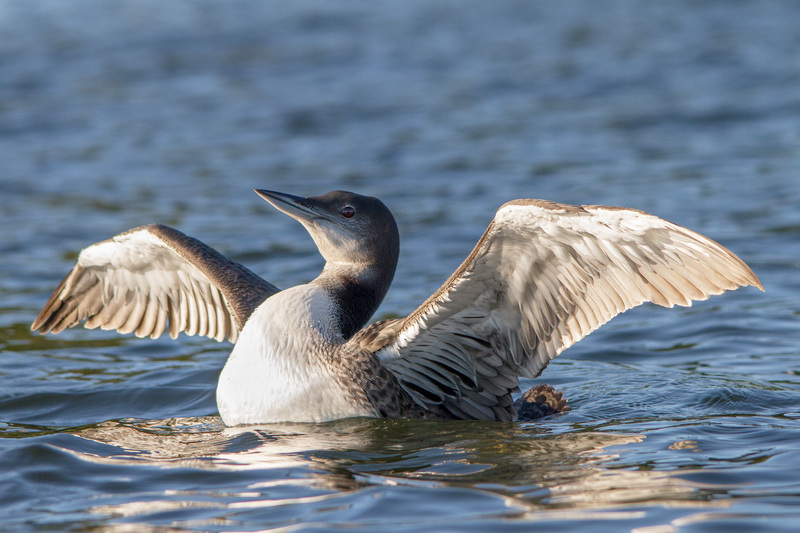 It is even possible that young loons — especially males, which often settle to breed within a few short miles of their natal lake — move from lake to lake in order to create an internal map of the local area, which they will use in a few years when they return in adult plumage and seek a breeding territory. As I have noted before, the more immediate reason for tracking local movements of young juveniles has to do with learning about the development of natal-site matching behavior that we found recently. (Natal-site matching refers to the striking tendency of young loons to settle as adults on lakes that are similar in size and water chemistry to their natal lake.) 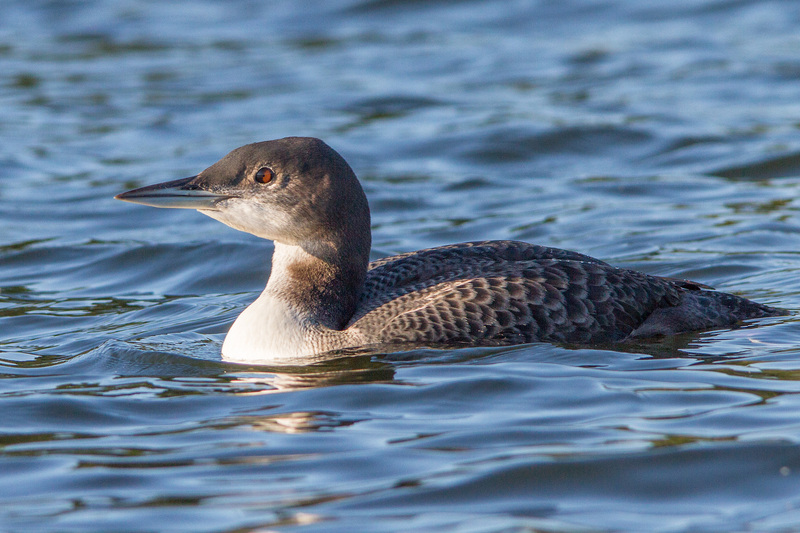 We are curious to see whether loons show preferences for natal-like lakes even in their juvenile movements. If so, short trips during the fall to natal-like lakes will, of course, reinforce natal-site matching and yield young adults that have very strong natal preferences indeed! Thanks, as so many times before, to Linda Grenzer, who provided these nice shots of the 2014 chicks on her lake. Although it is bittersweet for her, Linda hopes that these two juvies will soon themselves fly off to nearby lakes to gain valuable experience — or maybe just weight — that will prepare them for migration and beyond. We are not the first to observe behavior of this kind. It has been reported occasionally on large lakes that chicks get “scrambled up” and end up with the wrong parents. But we had never observed it in our study area. To see it occur twice in the same day is quite extraordinary and makes us wonder why and how it occurs at all. So why does this behavior occur at all? We do not know at present, but I can offer one plausible hypothesis. This time of year is characterized by high rates of territorial intrusions. When intruders enter a territory with chicks, chicks hide out near shore and leave their parents to engage the intruders. Parents and chicks are reunited only after all intruders have left the territory, which might be an hour or more after intruders land. In most territories, which consist of single whole lakes, reuniting with parents is straightforward. Parents search where they left the chicks, and parents and chicks vocalize to find each other. But on large lakes, it is conceivable that chicks might lose track of their parents (and vice-versa) following intrusions. If chicks respond to the inviting calls of neighboring parents (which of course, are intended only for their own chicks), and neighboring parents accept non-biological chicks as their own, then chicks could wind up with the wrong parents. Scrambling of this kind would be most likely, of course, where two pairs with chicks use adjacent parts of a big lake. It will take more than two instances of chick scrambling for us to be able to discern its precise causes. But the loss of a chick or chicks by a pair could well have a negative impact on their fitness (i.e. if the lost chicks perish). So this behavior pattern seems important and worthy of further thought and study.